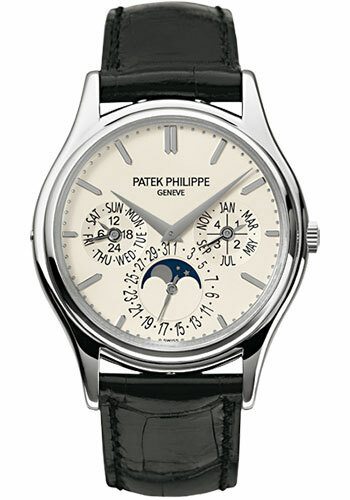 37.2mm 18K white gold case, interchangeable full and sapphire crystal back, opaline white dial, self winding caliber 240 Q movement with day, date, month, moonphase, and am/pm indications, approximately 48 hour of power reserve, black alligator strap with fold-over buckle. Water resistant to 30 meters. 37.2mm 18K yellow gold case, interchangeable full and sapphire crystal back, opaline white dial, self winding caliber 240 Q movement with day, date, month, moonphase, and am/pm indications, approximately 48 hour of power reserve, black alligator strap with fold-over buckle. Water resistant to 30 meters. 37.2 mm platinum case, interchangeable full back and sapphire crystal case back, charcoal gray sunburst dial with gold applied hour markers, caliber 240 Q self-winding movement with perpetual calendar (day, date, month, leap year by hands, moon phases, 24-hour dial), approximately 38-48 hours of power reserve, shiny black alligator strap with square scales, fold-over buckle. Water resistant to 30 m.
37.2mm 18K rose gold case, interchangeable full and sapphire crystal back, brown sunburst dial, self winding caliber 240 Q movement with day, date, month, moonphase, and am/pm indications, approximately 48 hour of power reserve, matt dark brown alligator strap with fold-over buckle. Water resistant to 30 meters.